The final portfolio post this month is a slide from a 16×9 high-def show (1920x1080px projection onto 28′ wide screen). The template design was subtle gradients with stylized swooshing lines (used in the collateral materials for the meeting). What makes this slide stand out is the photoshop work. 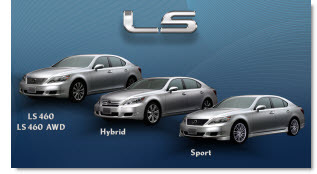 The ‘LS’ chroming and drop shadow was applied to standard text (using the provided Lexus font). Each car was cutout to remove the background (and keeping wheels looking round and proper is not an easy task). The text was done in PPT 2007 with a custom bevel effect. And the nice animation entrance cannot be seen in the static image – but it was nice too. With this project I received a “raw” presentation and was tasked with developing a new template and updating all of the slides. The great thing about the presentation is the content for each slide was very minimal, allowing it to be big – dominant – and on a dynamic template. 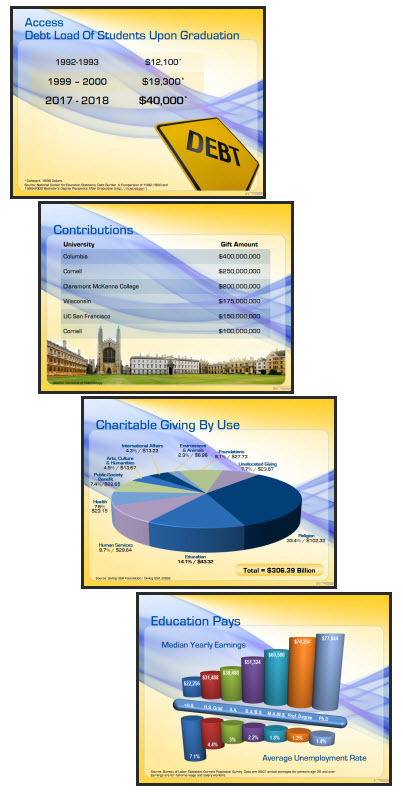 This project was for a university program. They needed a template that integrated their school colors, but was lively-energetic-modern-cool. That was the direction provided and from there I was able to go in any direction. I developed 5 concepts and this was the one selected. The full frame layout is unique in that generally this style master slide removes the title bar to allow room for images/charts that need the full frame. In this template the title are is actually defined by the absence of the content area. So the Full Frame slide has the content area extended, creating a full canvas for content. Of course there is a lot of competing visuals with a template like this. The background is full of contrasting, dominant shapes. It has a definite flow that draws the eye across the slide (from left-right). Lots of small text could easily become lost. And this would not be first choice for “standard” corporate template. For this project I was provided the full (raw) presentation before any design work began and was able see the type of content. Because the content was large, minimal and to-the-point (eg. no inserted 200 cell excel charts or 20 bulleted lines) I was able to go with a more dominant and visual template design. 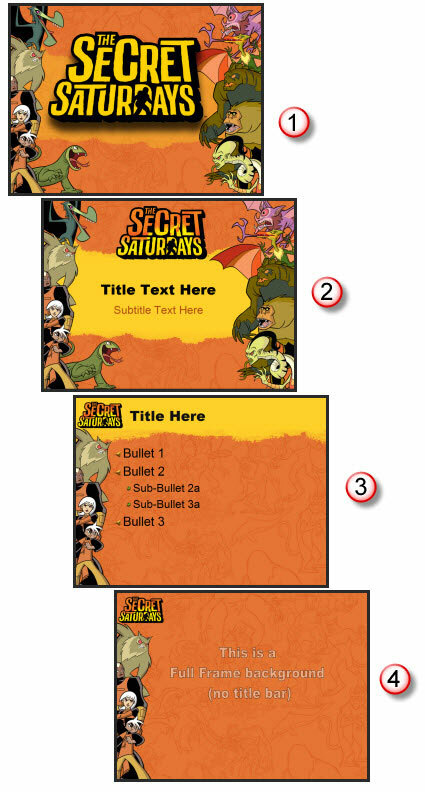 If you have boy, age 6-12, you a probably familiar with Secret Saturdays. This is a new cartoon series on Cartoon Network and with my 3 girls I was forced to enjoy some research watching several episodes to get in touch with my inner adventurous boy before developing this marketing template. Working with entertainment properties, especially animated properties, is great. They have all the visual assets needed. And they are all high-res and layered (so no background). Definitely not your standard corporate template – and I bet these presentations are more fun to sit through! I did a series of print design projects and this is one piece from them. Working from a hand drawn diagram I recreated the flowchart and content in the coordinated colors and design scheme. 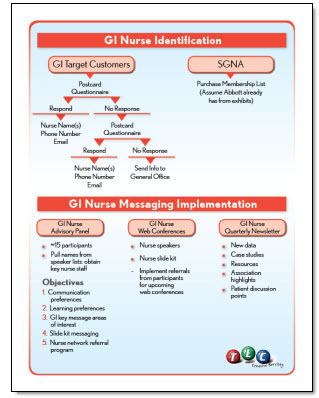 This is a standard US Letter size piece that was supplied to the client as a print-ready PDF that could be used on the local color printer or sent to a print shop for large volume printing, all from the same file as there is no ‘bleed’ (color extending to the edge), which was a purposeful element of the overall design. Here is the title slide from a recent PowerPoint template project. 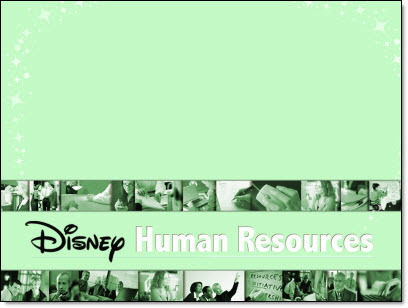 This one was great, because after it was approved the same design was then applied to other departments/divisions each disquinshed by having their own color scheme (eg. blue, tan, yellow tinting vs. the green tinting in this one). For the project I was supplied with some great Disney art elements such as the Disney logo and the stars which I turned into a star trail that framed the text area and added a feeling of motion. This is just 2 quick slides from a recent project, that were actually supplied to client before the real production began. The request was what could be done with all of the supplied images to give them a professional and consistent appearance. I took this supplied image and first removed the background. I worked in Photoshop to do this. PPTs eyedropper would be an option, but it would remove any of the white inside the towers, which would really affect the right one. In Photoshop with the background removed it was saved out as a .png with transparency. The reflection was applied in PPT 2007. 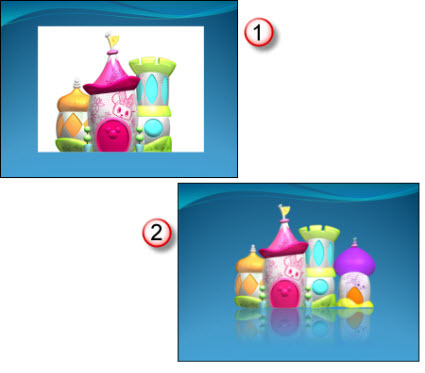 I also grouped in another image (far right) to show how multiple images could easily be added to the layout, which was not an option with the opaque background on the originals. This is the lecture mentioned in the previous post. This is a great use of PowerPoint and is a great teaching tool! 1. Raw video recording of the instructor/presenter (recorded by professional video crew with monitored audio recording). 2. PowerPoint slide deck instructor used. 1. Edit video to remove long pauses, audience comments (no handheld microphone for audience, so to quiet to hear on recording), pan & zoom (crop) to bring presenter to full screen (especially important as video of instructor is small). 2. 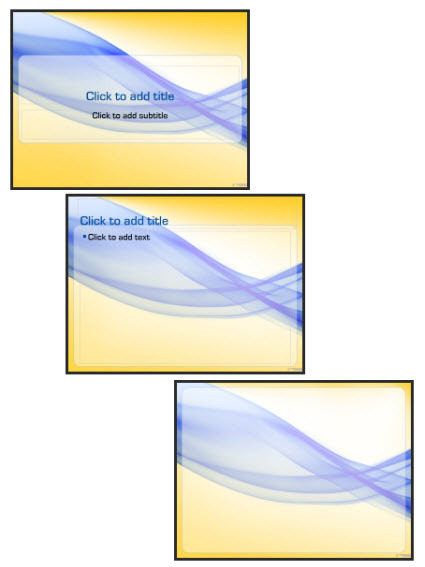 Optimize PowerPoint deck for use in video. 3. 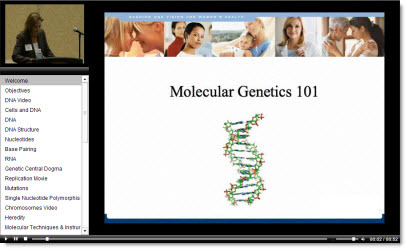 Sync lecture and slides (this is time consuming when there is no cue sheet or wide angle recording to see both the presenter and the projected slides – but I did learn a lot about molecular genetics as I listened to the full lecture 3-4X’s!). 4. Setup the interactive table of contents. 5. Render video(s), which were .flv format. Instructor at 29.97 FPS and slides at 5 FPS. 6. Prep for CDROM playback. 7. Prep for local computer (hard drive) playback. 8. Develop custom installer to automate process of copying files to computer, creating shortcuts, etc. 9. Develop the launch/install app. outlined in previous post. The actual project was a multimedia video lecture (highlighted in next post). But to provide a professional piece and give the end user a visual interface this ‘Launch and Install’ application was developed. The end user received a CDROM and when they insert the CDROM this user-friendly application automatically runs. 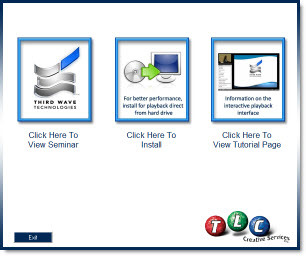 The Launch-&-Install application gives an intuitve graphic interface to running the lecture from the CD, installing the lecture files onto their computer, or viewing a quick tutorial on the lecture playback controls and options. On the technical side, the application runs in a 800x600px window that is moveable and weighed in at just over 1MB. Many projects need to have multiple items all coordinate. Here is the CD label from a multimedia project that I used the same visual elements and layout style for a Launcher Application, video lecture series and this CD label. This is the client proof which shows the center of the CD and a keyline around the actual circumfrence. The graphics extend beyond the actual CD size to give the printing process ‘bleed’ just in case the printing is not perfectly centered. The final print-ready file that goes to the printer does not include either of the black overlays.